I love to travel. Being in the wilderness and seeing the exceptional beauty that exists in nature brings me great joy. However, it can be a challenge to be away from family and friends for long periods of time. I was particularly aware of this fact when I awoke in Haines, Alaska on the shores of the Chilkoot Inlet of the Pacific Ocean. It was almost Father's Day and my mother was nearing her 70th birthday but that was in Belleville, Ontario and I was over 5700 kilometres and a 61-hour drive away. I wasn't going to make it. Technology can be such a double-edged sword but this time I used it to my full advantage. I eased my slight homesickness by skyping with my parents. We talked a bit about my latest escapades (I saw grizzly bears!) and I wished them both well. Now what? I decided that the weather was just too good not to go kayaking. I opted to put in at nearby Chilkoot Lake State Park (they call it a state recreation area but what's the difference?). What an amazing place to kayak! The snow-capped mountains rose directly from the lake. The complete absence of wind led to stunning reflections on the water. And to top it all off, a family of common mergansers was very accommodating and posed for some nice portraits. It was a challenge to get all of the little ones facing the same direction! After my brief tour around the perimiter of Lake Chilkoot, I returned to Haines, thankful for some pretty birds along the way. Harlequin ducks are uniquely adorned with white spots and cinnamon patches. They're unmistakable. I had seen singles in Ontario before but never a group. Sweet! Also in the water were huge groups of white-winged and surf scoters. They looked like synchronized swimmers as they dove in sequence. I couldn't tell which one was the choreographer. I also lucked into a species I had never seen before - a pigeon guillemot. It was way out there and I had to zoom in on the photo to identify it but it was also unmistakable - the black triangular patch jutting into the white leaves no doubt. Long road trips are extraordinarily fun put there are times when some less-than-fun events just have to happen. Take the front seat of my car. Without a passenger to keep it occupied, it becomes a bewildering mess of maps, food (both ready to eat and already eaten), cutlery, cameras, backpacks, clothes, and whatever else one accumulates while crossing international and provincial borders. June 16 was the day - it had to be cleaned. Ah, there's where that orange peel went! What a glamorous life I lead. Another spectacular actually-includes-food-that-needs-refrigeration meal awaited me. The nice lady at the RV park informed me of a potluck crab dinner that she organizes every year for occupants of her establishment. She arranges with local fishermen to get local crab the day we're going to eat them. I was more than happy to provide couscous cooked on my campstove to a fantastic assortment of king crab legs, salads, and other meals cooked by the other campers. I love crab but I was once again reminded how frustrating it can be to eat it! I was forced awake before 6:00 AM by a problem I did not expect in Alaska - the blazing sun. I tried to overcome its intensity but it was a losing battle. I eventually gave up and decided to go for a drive at 6:30 AM. Shortly after leaving Haines, I had a close encounter with a grizzly bear, likely the same individual I saw wandering around the day before within 30 feet of unsuspecting locals. This time, it occupied the oncoming lane of the road and it walked right past my car, close enough that I could have touched it. I think it wanted me to roll down my window and give it a high five but my boney hands would have been no match for its massive claws. After breakfast, I packed up my tent and got ready for the ferry ride to Skagway, Alaska. It was lightly raining when I got to Skagway after lunch so I didn't stick around. Instead, I continued north towards Yukon. I got to the now-familiar Robert Service Campground on the edge of Whitehorse, selected site #68, ate dinner, and headed into town to peruse wilderness of a different sort - Walmart. It was raining more heavily as I exited the store and that's when disaster struck, in a first world lucky guy kind of way. My iPhone was not secured in my shorts pocket and as I ran to avoid the rain, it popped out and crashed into the parking lot pavement below. Was it damaged? You betcha. The front screen was shattered but it still worked. I would have to get it fixed but that wouldn't happen until I got to Vancouver. My extraordinary luck with precipitation continued as there was no rain overnight. Despite the ominous signs above, it remained clear in the morning as I packed up my tent. I stopped for an oil change in Whitehorse before heading back into British Columbia. Have I mentioned that I love road trips that are so long that you need to get an oil change? I was particularly happy on this trip as I was beyond 10000 kilometres and had already endured my second. I drove almost all day and arrived at the junction of the Alaska Highway and BC's Highway 37 (the Stewart-Cassiar Highway) at 4:10 PM. Soon after turning south onto Highway 37, I encountered a mother black bear with a cub. That's always a fun sight but this little one, though still cute, looked a little ragged. There aren't many provincial campgrounds in the extreme northern reaches of BC so I opted to stay at Boya Lake Provincial Park. There was another black bear beside the park's entrance road to remind me to be extra careful with food in my campsite. Boya Lake is a gorgeous lake. It is an amazing aquamarine colour and when I was there it was extremely calm. I went for two short paddles - one in the evening and again the next morning before I left. I was hoping for lots of wildlife but I only saw spotted sandpipers and red-breasted mergansers. After my early-morning paddle I packed up and headed further south along Highway 37. Having read a report that one guy had seen 37 bears along this stretch of road on a single trip, I kept my eyes peeled. However, there was a light rain the whole time and I had to wait at least two hours before I saw my first bear. Pity me. There was a grizzly about ten kilometres north of Meziadin Junction and a black bear about nine kilometres past that. At Meziadin Junction, I decided to head west on Highway 37A towards the twin towns of Stewart, British Columbia and Hyder, Alaska. Highway 37A is also known as the Glacier High and I would soon find out why. The views along the highway are incredible! You drive right beside massive sheets of ice and snow, majestic mountains, and lush green forest. If you are ever in this area, the side-trip along Highway 37A is a must! After stopping to revel in the glory of a few mountains, I arrived in Stewart, BC and opted to camp in the Bear River RV Park. It had free WiFi, pay showers, and a nice location slightly away from the main part of town. It doesn't usually host tents but they let me put mine up on the quiet lawn beside their infrequently used laundry room. Everything about the location was terrific except for the bugs. They tormented me while I put up my tent and I had had enough before dinner. I locked myself in my car to separate myself from my biting neighbours and enjoyed salmon salad sandwiches and canned peaches. After dinner, I drove to Hyder, Alaska. Even though they share an international border, Stewart and Hyder have different approaches. There is no US Customs office in Hyder so you are free to go to that part of the United States without stopping. However, there is a Canada Customs office in Stewart so when you return from Hyder you have to go through customs. Over the next few days, the friendly people at that border crossing really got to know me well! Hyder is another beautiful location. Everything was so green! Hyder is famous for its Fish Creek Wildlife Observation Site, where you can walk on a boardwalk directly above bears hunting in the stream below. Alas, I wasn't there at the right time of year for that experience. However, I did see a grizzly right beside the road nearby. It allowed me to get full-frame shots with a 300mm lens, something that would not be recommended unless you were protected in some way. I fear for this bear. It's yellow ear tag likely indicates that it has had previous human encounters. On the short drive back to Stewart I saw two more black bears, one of which climbed a telephone pole to escape! I could get used to waking up in Stewart, British Columbia, especially at this time of year. I can't get over how alive everything seems. The rivers are flowing, vegetation is growing, and the birds are singing. I headed into Hyder and walked along its main drag. Walking back to my car, I saw a black bear with two cubs race across the road right behind my car. I was struck by the nonchalance of the locals. I have great respect for bears and the damage they could do but the locals seemed completely indifferent. I guess if you see bear cubs almost every day it just becomes part of the routine. I hope I never become that jaded to the beautiful sight of bears! After lunch, I drove to a glacier. What a fantastic concept! Let me say it again. I drove to a glacier! The Salmon Glacier is supposedly the largest glacier in the world where you can drive to its end. To put it mildly, I am a fan. Getting to the glacier was definitely part of the fun. The gravel road twists and turns its way up a mountain and there aren't any guard rails. In many places, water flowed directly across the road and I could see significant washout potential. 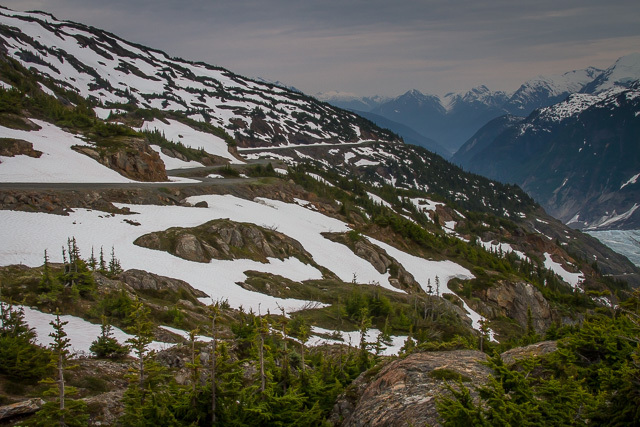 The panorama view at the end of Salmon Glacier Road definitely made the drive worthwhile! On the drive back to Stewart, there were seals in the harbour and terns, cedar waxwings, bald eagles, and kingfishers along the estuary trail. Bears, glaciers, and seals, all on the same day. What a magical place!